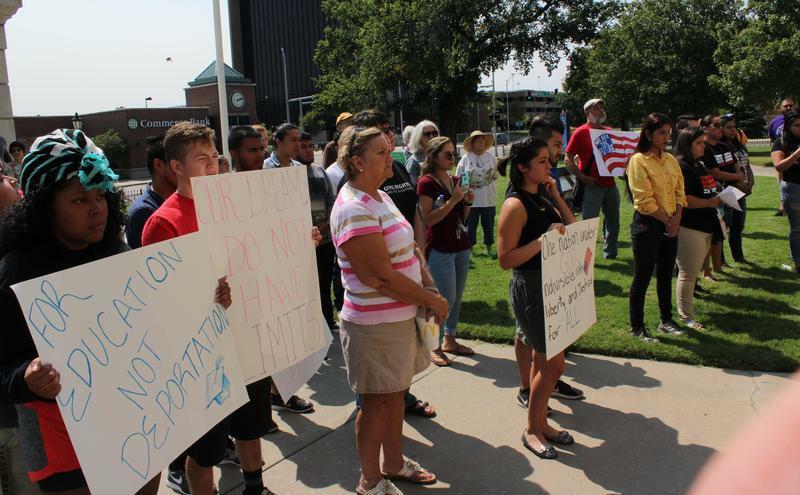 Supporters of the Deferred Action for Childhood Arrivals program rallied Tuesday outside the Sedgwick County Courthouse in Wichita. President Donald Trump is giving Congress six months to come up with a solution to help unauthorized immigrants brought to the United States as children, including thousands in Kansas. U.S. Rep. Roger Marshall, a Republican who represents the 1st District in Kansas, concedes that President Barack Obama’s 2012 executive order that provided a reprieve from deportation through the Deferred Action for Childhood Arrivals program — also known as DACA — may not have been constitutional. Marshall says law-abiding young people who are in school or have jobs should be granted some sort of legal residency status, with a two-year renewal process. Kansas was one of 26 states that had sued over DACA, charging that Obama did not have the authority to create the program by executive order. Kansas Attorney General Derek Schmidt said in a statement Tuesday that he would now ask for the lawsuit to be dismissed. “The Trump administration’s actions today return the issue to the only place constitutionally empowered to resolve it: The United States Congress,” Schmidt said. Kansas Secretary of State Kris Kobach, who has advised President Donald Trump on immigration issues, discussed the future of DACA during several media appearances in recent days. Congressman Ron Estes of Kansas’ 4th District applauded the president for giving Congress time to fix the immigration system and secure the nation’s borders, without providing amnesty. And U.S. Rep. Kevin Yoder, from the 3rd District, expressed sympathy for those in DACA, saying he’s not in favor of deporting them. But Yoder said he opposed Obama’s executive order creating DACA and that only Congress has the authority to decide the status of minors brought here illegally. Trump’s DACA decision sparked a rally in Wichita, where immigration advocates also called on Congress to act. Carolina Hernandez is the immigrant justice organizer at Sunflower Community Action in Wichita. During the rally outside the Sedgwick County Courthouse, she urged those in the crowd to encourage Congress to protect those in the DACA program. “We might not know what our future looks like in six months, but we know we have an opportunity to come together,” she said. Hernandez is originally from Mexico and enrolled in DACA in 2012, when she was 16. When her permit expires in 2019, she won’t be able to reapply. Leaders of organizations that serve Latino families in the Kansas City area share Hernandez’s concerns. El Centro officials and many area educators have been worried about the end of DACA since the election, Caudillo says. Some local institutions have embraced DACA students. 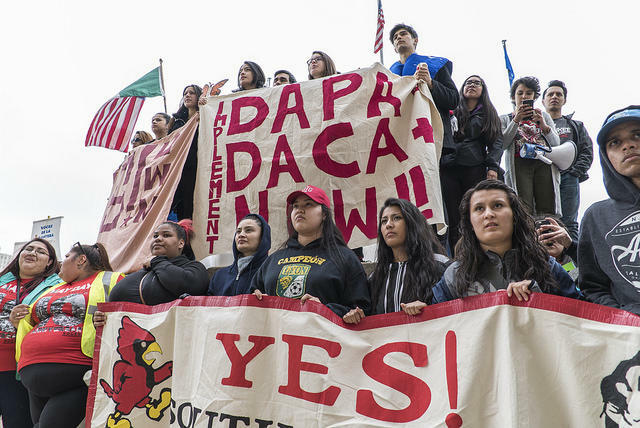 Over the last several years, Kansas State University has been recruiting DACA and other students who are in the country illegally, using privately raised money to provide grants and scholarships. Bryan Thompson is a reporter for the Kansas News Service, a collaboration of KCUR, Kansas Public Radio and KMUW covering health, education and politics. Nadya Faulx with KMUW in Wichita and Sam Zeff with KCUR in Kansas City contributed to this story. Kansas News Service stories and photos may be republished at no cost with proper attribution and a link back to kcur.org. Many organizations and schools in Missouri and Kansas that serve Latino families blasted the announcement Tuesday from Attorney General Jeff Sessions that the Trump administration will end the Deferred Action for Childhood Arrivals (DACA) program in six months if Congress fails to act. Immigration is a hot topic at all levels of politics. Whether the debate is over a wall along the Mexican border or granting in-state college tuition to people brought into the country illegally in Missouri. But one area university is bucking the trend and aggressively recruiting students that other univiersities are unable or unwilling to help.For Maria De La Torre, a graduate of Kansas City Public Schools, Kansas State University just might have saved her academic career.